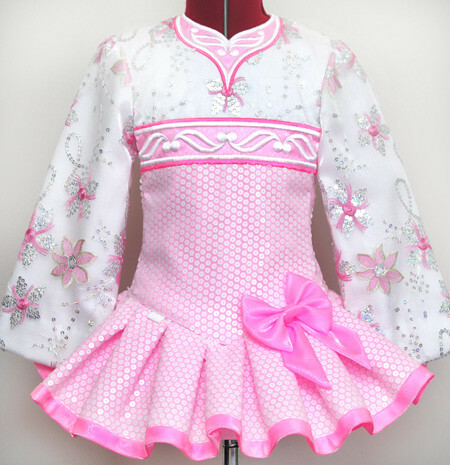 Centre front dropped waist to hem: 5½"
Baby pink twinkle satin bodice with white sequin overlay, with pretty white embroidery design across bust and neckline. Sleeves and top of bodice constructed from adorable white and baby pink floral lace with silver holographic sequin accents. 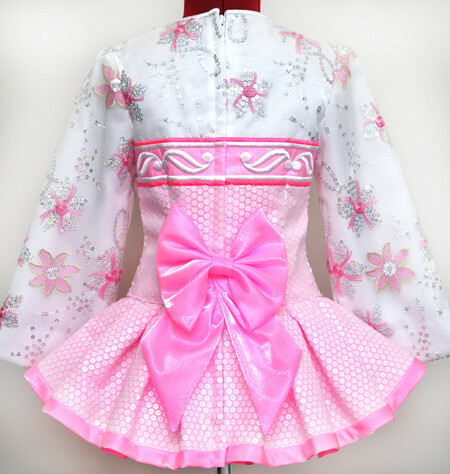 Modern style wave skirt constructed from matching baby pink satin with white sequin overlay. Gorgeous small baby pink bow attached to left side of dropped waist point matches a larger shawl bow on back skirt. Pink and white polka dot cotton underskirt lining.